Condition: Very good. Flattened. Ample margins. Few very small professional repairs in left image part. Else excellent. Verso: blank. Rare and spectacular, separately issued double hemisphere world map. The double spheres and the two smaller celestial spheres at centre, are bordered by detailed tables of degrees, both in French and German miles. The four elements Air, Earth, Fire and Water are represented in each corner by an eagle, land animals, a dragon and sea creatures. 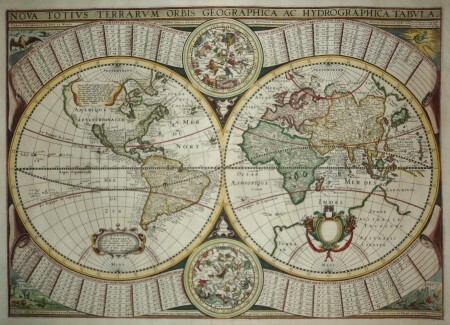 The top right panel of the map includes the date and Tavernier's name, which is also found again in the lower right cartouche. This map is Tavernier's second map of the world, which includes dramatic revisions to the Northwest and Northeast Coastlines of North America. California is shown as an Island, with a marvelous conjectural Northwest Coastline partially hidden by a text cartouche. No sign of New Zealand, but a fabulous Terrae Australis is shown. The tip of the large southern landmass, Terra Australis Incognita, is named Beach, which can be traced back to the incorrectly scribed accounts of Marco Polo's travels, which mistakenly corrupted Polo's mythical kingdom of Lochac to Boeach, which was then shortened to Beach. Mercator included both Lochac and Beach and in doing so established an error that would persist on maps well into the 17th century. 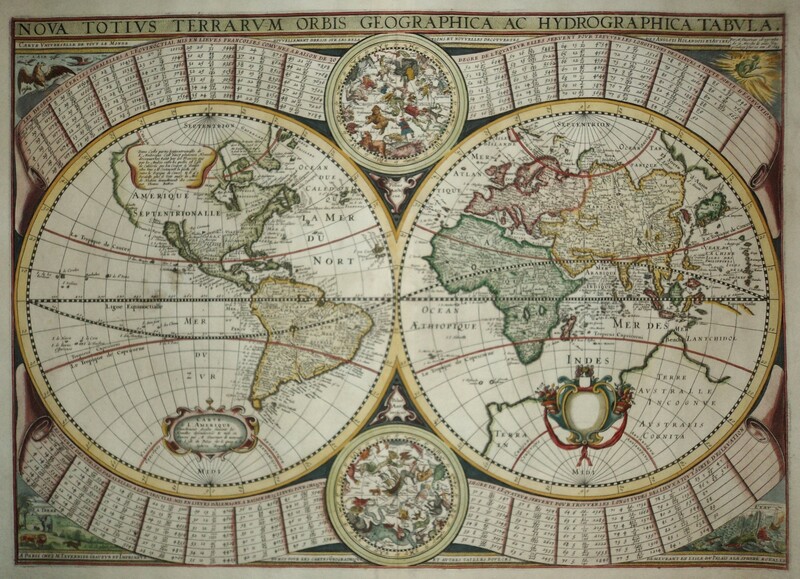 Spectacular world map, published by M. Tavernier, Paris, 1643.